Although betrayed by His Cardinals beginning on the day of His Divine Election, October 26, 1958 A.D., put under constant surveillance, a documented death-threat, and having absolutely no temporal arm to turn to for help- Pope Gregory XVII, by a near miraculous occurrence shortly before His "unforeseen" death on May 2, 1989 A.D., did perform the proper actions to carry on the True Hierarchy (Petrine Mission) of the True Church. Fr. 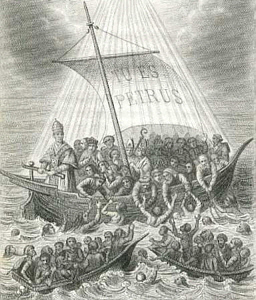 Khoat had several audiences with Pope Gregory XVII, after this initial one. 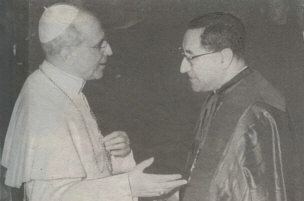 As he emerged from the meeting with Pope Gregory XVII (where His Holiness confided to Fr. Khoat that his captors could *kill him at anytime) Fr. Khoat handed his camera to a person who was standing in the room, and asked him to take some quick pictures. Again, this was right in the heart of enemy territory (i.e. notice the picture of Antipope John Paul II in the upper right corner). 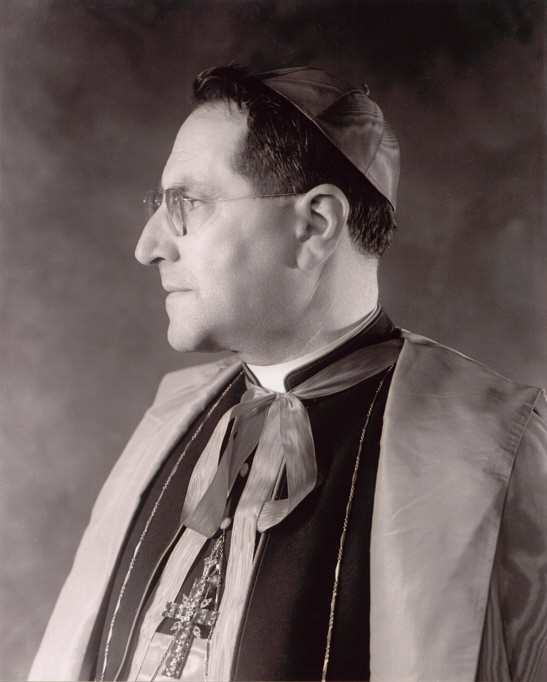 This Monsignor Grone- who posed to the world as one of the Cardinal's household (in fact his official Secretary) - was just the opposite. Fr. Khoat related later that he (Mgsr. Grone) was an enemy of de fide, whose duty it was to control Pope Gregory XVII. Grone adamantly tried to stop the picture from being taken. Note the look on his (Grone's) face, and the gestures he is making with his hands! It is fitting that Our Pope presented himself with dignity: he holds his hands to his cassock and stands firm. Also, look at his eyes, closely (see excerpt of Fr. Khoat's sermon below). *"If the prisoner martyr (Pope) directs a call, it will be forbidden, under pain of torture and death, for any kingdom to rush in response to his call." (Prophecy of Marie-Julie Jahenny [Aug 10, 1880], about Gregory XVII). Pope Gregory XVII instructed Father Khoat to return later to the convent saying, "Come back here at eight o'clock tonight my secretary will be gone then." Fr. 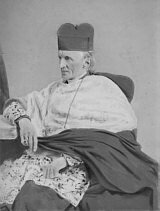 Khoat obeyed, and brought a trusted contact, Monsignor Carlo Taramasso, with him from nearby Santa Marinella (and eventually two more trusted witnesses were summoned: which included the well-known Italian prelate, His Excellency, Archbishop Arrigo Pintonello). "It is completely ridiculous to say that any cardinal would have been elected." no enemies." -Antipope John XXIII (Enemy #1), speech from the balcony of St. Peter's, Oct. 28, 1958. The perfidious media would coin him, "Good Pope John". Antipope John XXIII wasted no time with his plan to subvert the entire Catholic Church with a "new gospel" which was inaugurated at his Apostate Vatican II Council; whose false teachings have thrown the "Church" and the temporal sphere into unprecedented chaos. (A.K.A Antipope John XXIII) would exile the true Pope, Gregory XVII, to Genoa, Italy where the Holy Father was a tortured captive of the Roncallian V-2 Masonic sect for more than 30 years. 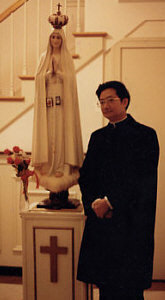 This tragically fulfilled the words of Our Lady of Fatima that if her requests of prayer and penance were not regarded, "...the Holy Father will have much to suffer". [a false "pope"] is to be out of communion with the Church." God tests us by letting us chose between light and darkness, between loving obedience to His Catholic laws or rejection of them. If we sin He withdraws His light. If we are theologically ignorant, and lacking in sufficient devotion, we shall not achieve our salvation. 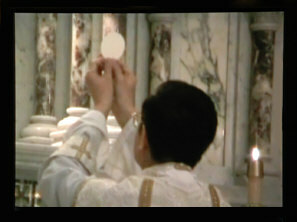 of the innovations, fantasies, frivolities in the liturgy. [who was] the TRUE Pope. Finding him took so long. (Prophecy of Ven. Bernard de Bustis, 15th c.): "...near the time of the Antichrist, will come... a most violent conflict with the Roman Church such that there will be great tribulations. At this time, a schism will be produced in the bosom of the Church on the occasion of the election of the pope... there is one who will be called the true pope, but he will not be truly so. He will persecute the true pope and all those who obey him, so that the majority will declare themselves for the antipope rather than for the true pope. But this antipope will have a sad end, and the true one will *REMAIN the unique and uncontested pontiff. 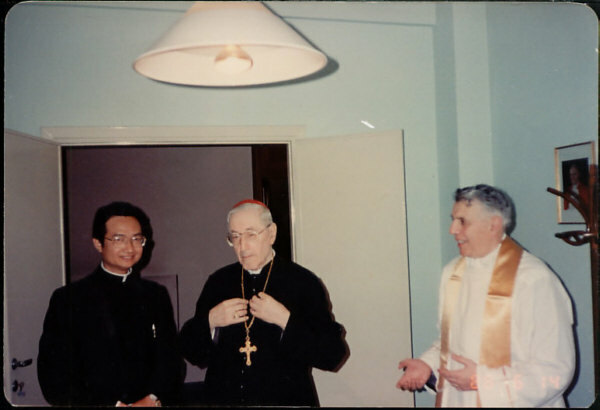 ..."
the last Cardinal made by Pius XII in 1953.
took place in Rome on June 14, 1988." innovations, fantasies, frivolities in the liturgy. Then we must search for the papacy until we find it. 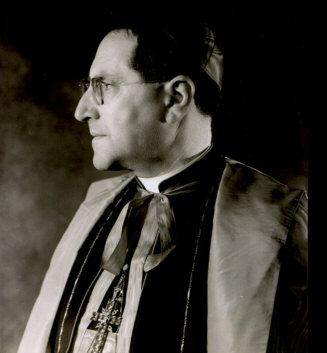 Now at last, we know that the true pope was Giuseppe Siri. requires the commitment of all the true Catholics in the world. The news... has reached many countries in Europe. 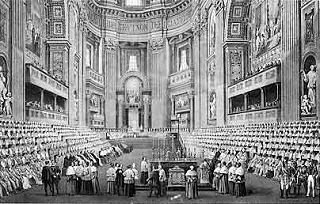 And everywhere the positive response of the faithful to the papacy restoration movement is growing." -The Rev. Fr. 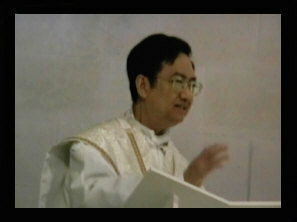 Khoat Van Tran (from his sermon) Where is the Papacy? they by necessity for salvation are entirely subject to the Roman Pontiff." "Therefore, if anyone says that it is not by the institution of Christ the Lord Himself (that is to say, by divine law) that blessed Peter should have perpetual successors in the primacy over the whole Church; or that the Roman Pontiff is not the successor of blessed Peter in this primacy: let him be anathema." (TCW) March 12, 2017 A.D.
(TCW) March 8, 2017 A.D.
(TCW) March 5, 2017 A.D.
(TCW) March 2, 2017 A.D.
(TCW) DECEMBER 1, 2016 A.D.
(TCW) OCTOBER 12, 2016 A.D.
IS A NEW PERFIDIOUS "SEDEVACANTIST TYPE" SECT EMERGING? (TCW) JULY 14, 2016 A.D.
PEOPLE MUST CHANGE THEIR THINKING IN ORDER TO END CRISIS OF "THE ECLIPSE OF THE CHURCH"
(TCW) June 29, 2015 A.D.
(TCW) May 18, 2015 A.D.
(TCW) April 30, 2015 A.D.
CH. 2 "SMOKE FROM THE SISTINE CHAPEL. CONFUSION." (TCW) April 3, 2015 A.D.
(TCW) November 25, 2014 A.D.
(TCW) November 23, 2014 A.D.
(TCW) October 26, 2014 A.D.
(TCW) October 12, 2014 A.D.
(TCW) October 1, 2014 A.D.
(TCW) September 18, 2014 A.D.
(TCW) August 30, 2014 A.D.
(TCW) August 29, 2014 A.D.
BOOK BY GREGORY XVII "SIRI" TRANSLATED INTO ENGLISH! (TCW) August 28, 2014 A.D.
(TCW) August 15, 2014 A.D.
(TCW) August 27, 2013 A.D.
(TCW) August 18, 2013 A.D.
(TCW) August 15, 2013 A.D.
(TCW) JULY 17, 2013 A.D.
(TCW) JUNE 1, 2013 A.D.
(TCW) May 29, 2013 A.D.
(TCW) May 17, 2013 A.D.
(TCW) May 9, 2013 A.D.
(TCW) April 13, 2013 A.D.
(TCW) December, 25, 2012 A.D.
(TCW) January, 1, 2010 A.D.
(TCW) September 3rd, 2009 A.D.
(TCW) May 21st, 2009 A.D.
(TCW) February 28, 2009 A.D.
(TCW) August, 10, 2008 A.D.
(TCW) July 23, 2008 A.D.
(TCW) April 17, 2008 A.D.
(TCW) February 3, 2008 A.D.
GREGORY XVII UTILIZED CATACOMB STRATEGY TO "CONTINUE" CHURCH (INFORMATION ON HIS CARDINALS 2008 A.D.) (TCW) January 6, 2008 A.D.
(TCW) December 12, 2007 A.D.
(TCW) December 9, 2007 A.D.
(TCW) October 24, 2007 A.D.
(TCW) September 6, 2007 A.D.
(TCW) August 25, 2007 A.D.
(TCW) July 3, 2007 A.D.
(TCW) June 13, 2007 A.D.
(TCW) May 2, 2007 A.D.
(TCW) April 29, 2007 A.D.
(TCW) April 23, 2007 A.D.
(TCW) February 25, 2007 A.D.
(TCW) January 22, 2007 A.D.
(TCW) January, 18, 2007 A.D.
(TCW) December 03, 2006 A.D.
(TCW) October 29, 2006 A.D.
(TCW) September 19, 2006 A.D.
(TCW) June 19, 2006 A.D.
FR. KHOAT THE PRIEST WHO MET "CARDINAL SIRI" (A.K.A. POPE GREGORY XVII) CELEBRATES 39TH YEAR OF HIS PRIESTHOOD !!! (TCW) May 11, 2006 A.D.
(TCW) March 19, 2006 A.D.
(TCW) February 12, 2006 A.D.
(TCW) December 30, 2005 A.D.
(TCW) December 28, 2005 A.D.
(TCW) December 23, 2005 A.D.
"... never will a storm have been so strong against any other Pontiff." "Never, never will a storm have been so strong against any other Pontiff. He is already a martyr before undergoing martyrdom. He is suffering before the hour has come. But he offers his own person and the blood of his veins for all his torturers and for those who are making terrible attempts upon his life. How many exiles to be suffered!" "The apostasy of the city of Rome from the vicar of Christ and its destruction by Antichrist may be thoughts so new to many Catholics, that I think it well to recite the text of theologians of greatest repute. First Malvenda, who writes expressly on the subject, states as the opinion of Ribera, Gaspar Melus, Biegas, Suarrez, Bellarmine and Bosius that Rome shall apostatise from the faith, drive away the Vicar of Christ and return to its ancient paganism. ...Then the Church shall be scattered, driven into the wilderness, and shall be for a time, as it was in the beginning, invisible hidden in catacombs, in dens, in mountains, in lurking places; for a time it shall be swept, as it were from the face of the earth. Such is the universal testimony of the Fathers of the early Church." © StGemma.com Web Productions Inc. 2005-2017. All rights reserved.